The following article is written by a Twitter blogger who goes by Homy Lafayette (http:/.twitter.com/homylafayette). Link to HomyLayette’s Blogspot: http://homylafayette.blogspot.com/. ‘Delusions of candor’ is an ongoing series on the regime’s efforts to spin the news, create disinformation, and spread propaganda. A publication of the Islamic Revolutionary Guards Corps (IRGC) contended in its latest edition that the Green movement is being controlled by foreign powers and that its supporters are not only rabble-rousing anti-revolutionaries, but also worshipers of Satan. Literally. Brigadier General Yadollah Javani made the outlandish claim in a front-page editorial in Sobheh Sadegh (True Morning), a weekly news publication of the political bureau of the IRGC. Javani heads the political bureau, a subdivision of Leader Ali Khamenei’s representative staff within the Revolutionary Guards. Though not in the first tier of the Islamic regime’s power structure, Javani is considered close to the inner circle of IRGC officers and clerics around Khamenei and the views he expresses give an indication of the predominant ideology and tactics within that circle. He has been a strong proponent of efforts to paint the opposition as an instrument of foreign powers seeking the ‘soft overthrow’ of the regime. On August 16, he spoke to the Islamic Republic News Agency about Hedayat Aghaie, a jailed senior member of the Executives of Construction Party (Kargozaraneh Sazandegi) which is close to Expediency Council chief and Ahmadinejad rival Ali Akbar Hashemi Rafsanjani. ‘In his confessions, Hedayat Aghaie […] said that they had conducted polls in the subway, but that when they had submitted the reports to Mir Hossein Mousavi, they had said that the figures reflected the whole country,’ Javani told IRNA. 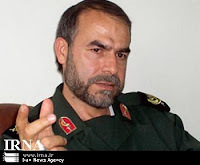 ‘[Aghaie] also confessed that their strategy was to gain power at any cost.’ Javani apparently did not consider it unusual that the IRGC political bureau boss had access to the interrogation reports emanating from the regime’s jails. Aghaie was sentenced to five years in prison in late October, according to his lawyer Alireza Jafarian. Also in August, a busy month for the indefatigable Javani, he called for the prosecution of opposition leaders Mir Hossein Mousavi, Mehdi Karroubi, the head of the Etemad Melli Party, and former President Mohammad Khatami. Who is pulling the Greens’ strings? In the name of God, most gracious, most meciful. There is no doubt that this movement was created by Mir Hossein Mousavi and his campaign staffs and his supporters. Mousavi appeared among the crowds of his supporters again and again and spoke of the green wave, and after the election called the Greens to the streets, thus paved the way for pockets of rebellion and unrest and public insecurity. It was Mir Hossein Mousavi who, by issuing a statement, founded the Green Path of Hope. On the surface, it looks like Mir Hossein Mousavi is leading this group, but the truth is that not only does Mir Hossein [sic. Javani forgets his manners from this point on.] not control this group, but that he and this movement are being controlled by foreigners. The truth is that not only does Mir Hossein not lead this group, but that he and this movement are being controlled by foreigners. It is not difficult to prove this point. Mir Hossein claims that he is faithful to the constitution, the Islamic Revolution, the Islamic Republic, and the goals of Imam Khomeini. Does the behavior of this small and seditious green-clad group in the events after the tenth presidential election, particularly on Ghods Day and November 4, correspond to Mir Hossein Mousavi’s claims? If it does not correspond to them, why does Mir Hossein Mousavi not repudiate these actions and chide his supporters? Let us look at examples of such behavior. 1. One of the slogans of the green-clad groupuscule on Ghods Day was ‘Neither eastern, nor western, an Iranian Republic’ instead of ‘Neither eastern, nor western, an Islamic Republic.’ If Mir Hossein claims that he is advancing the ideas of the Imam, why is he silent in the face of this deviation of his supporters? Why does he not issue a statement warning his supporters against this deviation? Did the late Imam, after reflecting on the term to be used to describe the political system of Iran, not say, ‘An Islamic Republic, not one word less, not one word more?’ Does an Iranian Republic represent anything less than the elimination of Islam from the political scene? ‘Neither eastern, nor western, an Iranian Republic’… Does an Iranian Republic represent anything less than the elimination of Islam from the political scene? 2. ‘Neither Gaza, nor Lebanon, my life only for Iran’ was the Greens’ famous slogan on Ghods Day. What is the position of Mousavi, who claims to follow the Imam’s Line, on this slogan? The Imam declared Ghods Day (NB Jerusalem Day) to be the day of Islam and by setting the strategy for the elimination of Israel from the pages of time, he defined Jerusalem and the Palestinian problem to be the most important issues for Muslims. If Mir Hossein is true to the goals of the Imam and he leads the Greens, why did he not condemn this deviant slogan on Ghods Day? 3. Consuming during the Ramadan fast, disregarding Islamic propriety, mixing boys and girls in the worst possible manner, and attacking Friday worshipers with stones were among the actions taken by the Greens on Ghods Day. (NB State media published photos of Ghods Day protesters smoking, which is banned during fasting hours in Ramadan. The news reports failed to mention that the protesters were blowing cigarette smoke into each other’s eyes to counter the effects of tear gas.) Does Mir Hossein condone such behavior? If not, why doesn’t Mir Hossein chide his supporters and condemn such actions? The Greens chanted ‘Death to Russia.’ In which backroom was this slogan devised? 4. On the national day of struggle against world arrogance (NB World Arrogance generally refers to the United States.) and the day of ‘Death to America’, meaning November 4, the Greens chanted ‘Death to Russia.’ What is Mir Hossein’s position on this slogan of his supporters? In which backroom was this slogan devised? Has Mir Hossein forgotten these words of the Imam: ‘Some chant death to Russia to make us forget America.’ If Mir Hossein does not agree with such slogans and considers them to be a deviation from the path of struggle against world arrogance, why doesn’t he admonish his supporters? 5. From the first days after the election, Mir Hossein’s green supporters were rioting, attacking banks, burning buses, attacking Basij bases, burning Lolagar Mosque, and damaging people’s property. They continued their ugly acts on Ghods Day and November 4, by burning garbage cans in the streets. Does Mir Hossein, who claims to be working within a legal framework, agree with such acts? If he doesn’t agree, does he strongly condemn them? Does Mir Hossein know that some green-clad young women and men who attended campaign rallies and ceremonies on Ghods day and November 4, wore symbols of deviant groups, including Satan worshipers? 7. Mir Hossein Mousavi considers the color green the symbol of the people and their ideals. Does Mir Hossein know that some green-clad young women and men who attended campaign rallies and ceremonies on Ghods day and November 4, wore symbols of deviant groups, including Satan worshipers? If he does know, how does he justify the combination of green and Satanist symbols? If this cannot be justified, why doesn’t he warn his supporters against it? Aren’t these Greens supporters of Mir Hossein? There are many examples like these. And if Mir Hossein or others like Khatami, Karroubi, or parties such as the Participation Front and the Mojahedin do not react to such actions and do not warn the Greens against such actions and slogans, it is because they know that these Greens are being controlled by others. They know that slogans like ‘Ya Hossein, Mir Hossein’ and ‘Karroubi, Karroubi, we will defend you!’ are only tools which exploit their names to oppose the religious regime. Mir Hossein knows that the Greens will disregard any admonishment or warning he issues and then it will be even clearer that the Greens and Mir Hossein are both playing in a field designed by foreigners. Mir Hossein spoke of green wisdom and founded the Green Path of Hope, but now this green movement is going in a direction which is warming the hearts of all anti-revolutionary groups. Why is Mir Hossein silent in the face of this deviation of his supporters? Why does he not issue a statement warning his supporters against this deviation?